A diagnosis of having facial Rosacea is something that is commonly heard in dermatologists offices today since almost 10 million people in the US are diagnosed every year. But what is not heard of as much is that almost 50 percent of these sufferers will also develop a condition called ocular rosacea, sometimes mistaken as just bloodshot eyes. But while red eyes are synonymous with late nights, allergies, and the common cold, ocular rosacea differs in the way that it presents itself, its treatment, and its cause. Those with facial Rosacea know when a flare-up is imminent. Redness, flushing, stinging are all common. With ocular Rosacea, the same occurs but with the eyes instead. Some report a feeling of having something stuck in your eye that just won’t get out. 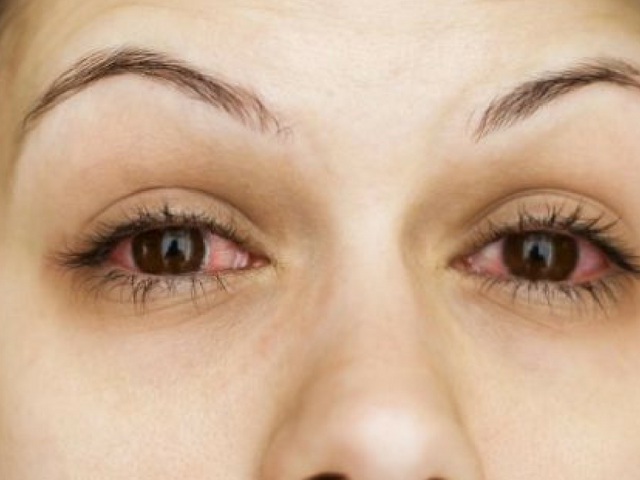 The eyes become extremely red and the surrounding area can be swollen and inflamed. You may develop a sty on a consistent basis. Since ocular Rosacea can also lead to vision loss, all of these symptoms require the attention of an ophthalmologist as soon as possible. So what is triggering this reaction? As with many facial Rosacea diagnoses, the cause of ocular Rosacea is often a mystery as well. But since the symptoms often go hand in hand with what happening to your cheeks, the triggers to ocular Rosacea can often be the same. Heat, alcohol, spicy food, cigarette smoke, red wine, excessive alcohol intake, and many health conditions like high blood pressure can lead to a case of severe inflammation. Other genetic predispositions and environmental factors can come into play as well, so it remains very important to be aware of what you were doing or eating when the onset of redness occurred. What can I do to treat this? Your ophthalmologist will be the correct person to diagnose and treat your condition. Do not risk vision loss by ignoring these symptoms. You will more than likely be put on a medicated eye care regimen that will help to greatly reduce your symptoms. Proper lid care is often very effective at relieving irritation. Warm compresses often give relief. Often using artificial tears will ensure that your eyes will not get too dry and will prevent further irritation. Do not use anti-redness eye drops without the recommendation of a doctor. It’s also important to keep the eye area clean and many methods can be recommended by your eye care professional. Special eyelid wipes can be used to wipe debris from the eyelashes as it becomes very important to prevent rubbing the eye area with fingers to prevent infection. Unfortunately ocular Rosacea, much like facial Rosacea, is an incurable condition. If you feel that your eye redness is not linked to your allergies and gets triggered by certain things you are aware of, like the foods you eat, a treatment plan from your eye doctor is likely needed and will help get your condition under control for good. And as the old saying goes, an ounce of prevention is worth a pound of cure.